Turn down the heat of a hot flush naturally, quickly, calmly and discreetly. 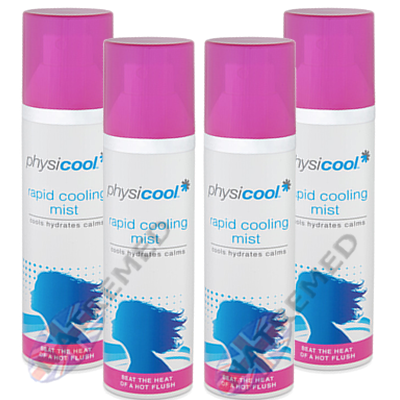 Physicool’s rapid cooling mist cools, hydrates and calms; putting you in control! Hot flushes and night sweats can seriously disrupt your work, sleep and quality of life; leaving you feeling irritated and tired. 9 out of 10 women reported that the Cooling Mist reduced their hot flush symptoms, and most said that their symptoms reduced quicker compared to other treatments. Using Physicool’s unique rapid evaporation technology, the Cooling Mist draws heat away from the skin, reducing skin temperature and calming redness. A consumer study revealed that 90% of menopausal women who used the Cooling Mist felt more comfortable, with 87% reporting that the cooling, calming effects lasted longer than an hour. The same number reported that, when compared with other menopausal products and treatments, Physicool’s Cooling Mist reduced their symptoms much faster.